Stationery, Business Cards, Calculators, Lanyards, Conference Products. Below is our range of stationery promotional products. Full range of promotional stationery products such as business cards, business card holders, rulers, pens, markers, flyers, badges, magnets, buttons, highlighters, staplers, calculators, folios, note books, pencils, sharpeners, pencil sets, mouse mats, letter openers, paper clips etc. Also at EPI we manufacture a large range of other stationery and office products such as rubbish bins, trays, storage trolleys, filing trays and much more. Click here. If you are looking specifically for printed promotional pens then click here. If you are looking for fridge magnets and adhesive labels click here. If you are looking for Resin Dome Labels click here. Colours (frosted) available - clear, pink, red, green, purple, blue, yellow, black and white. A unique plastic card that holds 7gms of sugar free mints. Note the prices above exclude GST. Printing setup $66.50 per colour and/or position. Includes first half hour of artwork. Subsequent extra artwork $75.60 per hour (both excl GST). Repeat prints in the future with no changes are $47.50 per colour/position. Print Area - 70mm x 15mm. A low cost business card holder to display cards on counters and desks. supplied in a box. Colour available - clear. Plastic pocket size card holder that can also display cards neatly on a desk. Print Area: Top - 40mm x 20mm. Stunning business card holder. Executive P.U. business card holder with metal hinged closure. Card size - 90mm x 55mm. Note printing can bleed off all four edges. Digitally printed on 300gsm matt finish cardboard. Reverse can be printed one colour or full colour. Price including Full colour print on front. Extra if printing on reverse. Dimensions: W 85mm x L 56mm x 1mm. Handy credit card sized magnifier. 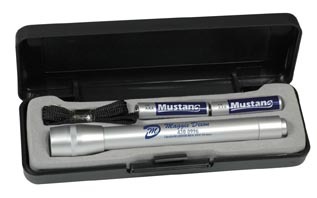 A unique retractable correction pen. Note limited stock. Colours - White with Black ribbon. Dimensions: W 38mm x L 140mm x 1mm. Book mark with a magnifiere and ruled edges. Dimensions: 93mm x 58mm x 7mm. Print area - 65mm x 45mm. Smart metal business card case. Print area depends on the size. Price includes full colour print. Pin on Button Badges, EPI Codes: See below. We now have a huge variety of different shapes and sizes. Great to keep your message in front of people. Make a statement. White plastic badge with clip. Note the prices above exclude GST. Printing setup $66.50 per colour and/or position. Includes first half hour of artwork. Subsequent extra artwork $75.60 per hour (both excl GST). Repeat prints in the future with no changes are $47.50 per colour/position. Print cost is per colour and position. Colours available: Yellow, Orange, Green. 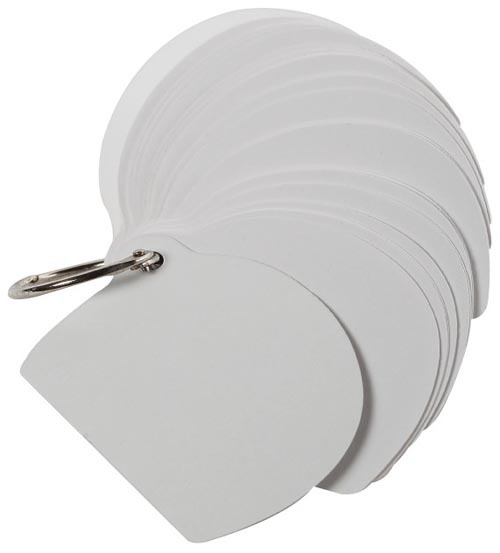 Add a little punch to your promo message with these plastic wrist slappers. Colours Available: Yellow, White, Green, Black, Blue. Click here to download the product spec sheet pdf. The cost effective tyvek wristbank is here in 5 colours. Tyvek is a brand of flashspun high-density polyetherlene fibers, a synthetic material and trademark of DuPont. The material is very strong, is difficult to tear, although can be cut with scissors easily. Tyvek is highly breathable. Print Area: Front 40mm x 10mm, Back 40mm x 25mm. Silver plastic mobile phone holder. Get your message on the desk every day. Colour - White Box, various colours of included items. Product Size: 106mm x 112mm. Print Size 80mm x 80mm. Stunning. 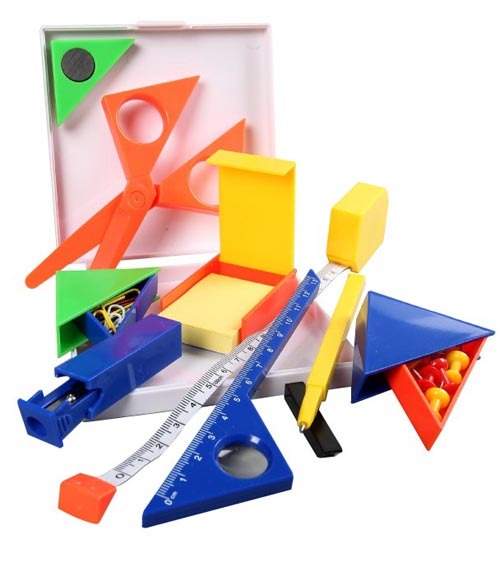 Includes stapler, scissors, paper clips and holder, memo cube, tape measure, triangle, pen, drawing pins wow wow wow!!! Dimensions: W 210mm x L 87mm x 5mm. Colours: White with Black rubberised base. Dimensions: Rectangle: W 235mm x L 195mm x 3mm. Round: Dia 198mm x 3mm. Stunning full colour printing. Has a non slip rubberized underside and a unique micro fibre surface for optimum results. Choice of two popular shapes. Note the prices above exclude GST. Printing setup $66.50. Includes first half hour of artwork. Subsequent extra artwork $75.60 per hour (both excl GST). Repeat prints in the future with no changes are $47.50 per colour/position. Colours available - Translucent red, trans green, trans blue, trans black. Print area to fit shape, but print area must be 30mm clear of wrist area. 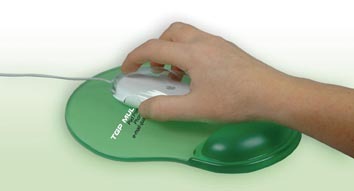 Luxury mouse mat with a comfortable wrist rest, non slip base and exacting mousing surface. Modern design highlighter with co-moulded rubber decoration. Colours available - yellow, pink, orange, green, blue, purple. Colours available - white, translucent red, translucent green, translucent blue. A functional magnetic pen for fridges and filing cabinets with black ink refill. The hottest new idea for highly visual fridge advertising. Dimensions: 150mm x 27mm x 5mm. Has a removable plug in the base so can be reused. silver with clear ruler parts. Right hand end - 25mm x 25mm. A functional 15cm ruler with a built in calculator. One of our most popular calculators. Short metal ruler with metric and imperial measurements. Dimensions: 165mm x 38mm x 6mm. Print Area: 70mm x 18mm or 45mm x 25mm. Dimensions: 156mm x 30mm x 3mm. Print Area: Pad print - 70mm x 10mm. Screen print - 140mm x 12mm. Colours available - white, yellow, red, green and blue. Supplied in a plastic sleeve. 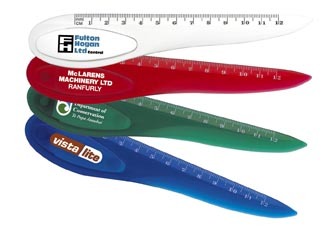 Plastic ruler with both centimetres and inches and a big print area. Also has a recessed bottom edge to give a novel "flip action" so the ruler can be easily picked up from a desk surface. A stunning 30cm Aluminium ruler with metric and imperial measurements, that is all class. Plastic bookmark, letter and ruler (inches only). 30cm plastic flexi ruler with cm and mm. Colours available - white or translucent blue. Printing Area - 50mm x 20mm. The letter opener has a very effective cutting blade for opening letters and plastic courier satchels. Puzzle with sliding tiles. Users reassemble the logo printed on the tiles. A handy pencil with a handy clip. Perfect for golf score cards and can be pushed into the ground as a ball market. Colours available - Translucent yellow, trans red, trans orange, trans green, trans blue. Print area 50mm x 7mm (1 side only). A low cost mechanical pencil with a super soft funky grip. Colours - pencils plain wood finish. Box - natural card. Box - 25mm x 20mm available on both the top and/or bottom. Six coloured pencils in a robust cardboard presentation box. Traditional carpenters pencil. Rectangle shape. 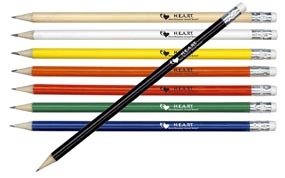 Colours available: natural, white, yellow, orange, red, green, blue, black. Screen Printing Cost 1 Colour Only. Dimensions: 90mm x 76mm x 60mm. Oval shaped metal pen holder. A pencil sharpener that holds its own shavings for easy disposal. Colours Available: Silver with Black trim. Dimensions: 85mm x 65mm x 45mm. Stylish 5 metre locking tape measure with both metric and imperial graduations. 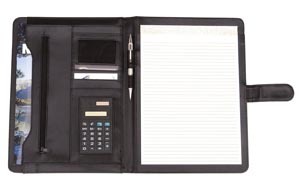 Comes complete with LED light, calculator and note pad. Colours available - black and yellow. Print area - 40mm x 40mm. 2 metre steel tape with metric graduations. Belt clip and wrist strap. Dimensions: Folded down - 125mm x 67mm x 10mm. Pen - 108mm x 6mm diameter. Unique and stylish aluminium perpetual desk calendar complete with metal pen. Print area - edge: 0.5mm x 16mm. Top: 18mm x 14mm half circle. 5 paper clips in a handy cost effective perforated strip..
Frosted clear plastic memo holder with metal clip. Your message will be right in front of your customer, prospect and anyone else you want to get a message to, when they are looking at something important. Product Colour - Frosted Clear. Product Size: 140mm x 49mm. Print Area: 30mm x 35mm. Print Area: 25mm x 50mm. 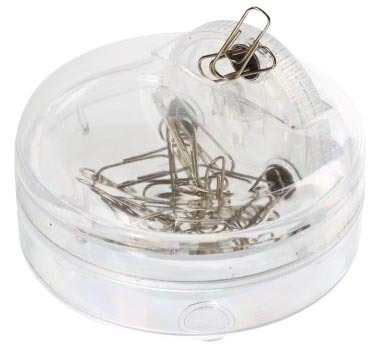 Clear plastic holder including metal paper clips in a great paperclip dispenser. Desk top clip dispenser with a convenient magnetised roller wheel for easy dispensing. Comes complete with paper clips. Print Area - 70mm x 60mm. Note pad refills are available for 63c each. 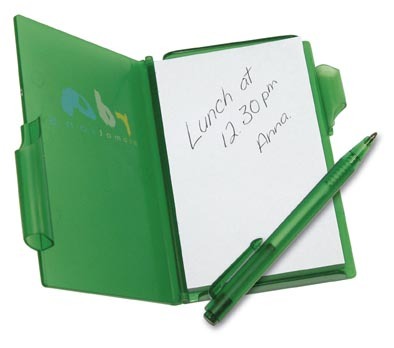 A handy low cost Aluminium note pad that can be used anywhere. Supplied in a box. 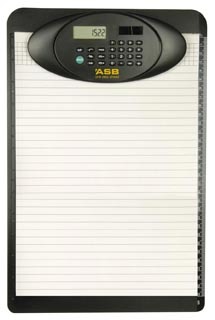 Robust aluminium covered note pad. Print Area -70mm x 50mm. Note pad refills are available for 36c each. Stylish spring loaded Aluminium pocket note book complete with a metal pen. A top class personal gift. Print Area - 85mm x 85mm. Quality metal finish desk pad. Spare pads available. Supplied in a box. Colours: White, Yellow, Red, Green, Blue. 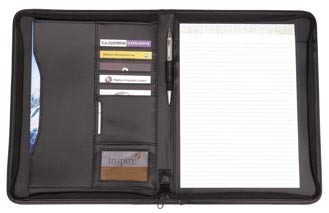 50 page wiro bound note pad with elastic pen holder & pen. Product Size: 70mm x 57mm. Print Area: 70mm x 57mm. Funky Pad with plastic top cover for great printing and promotional placement of your message. Colour Options: White or Natural. Print Area: 30mm x 50mm. White or natural card with assortee hand stick-its, place holders and pointers for documents. Very hand and will be greatly appreciated as a gift or promotional item. 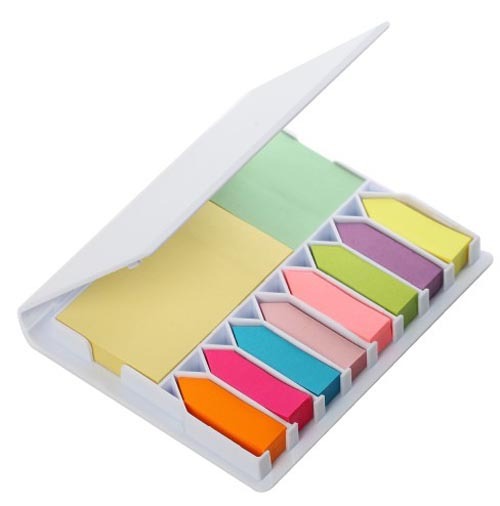 Pocket Rocket size note book which contains a pad of page flags in 4 bright colours and a pen. Colours: White, Yellow, Red, Green, Blue, Black. Stylish hard cover note book containing 2 different sized pads of stick anywhere adhesive notes and a pad of brightly coloured flags. Product Size: 110mm x 132mm. Print Area: 50mm x 45mm. 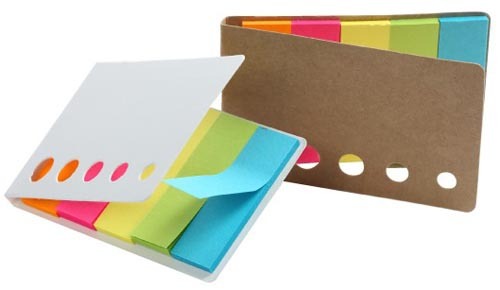 They're fun and they're practical, whtie plastic case with sticky notes in assorted sizes, styles and colours. Product Size: Note Book 130mm x 155mm, Pen 140mm x 13mm. Print Area: 70mm x 80mm. Eco Friendly cardboard notebook and cardboard pen with recycled plastic. To reflect your business or organisations care and move towards a sustainable future, what better way than showing this than this cool product. Colours Available: Frosted Clear, Frosted Blue. Print Area: 70mm x 120mm Note Pad. Super tough hard cover notebook with a wiro bound lined pad complete with a pen holder and pen. 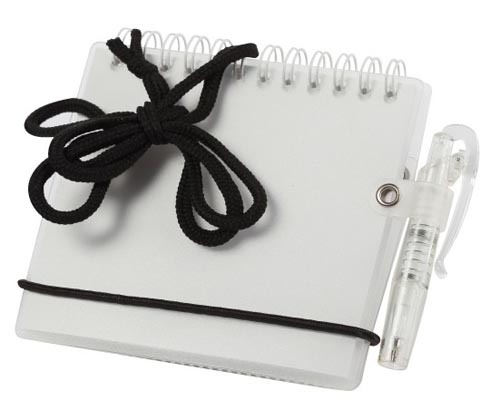 A wiro bound note book with an elastic strap to keep it closed and a pen. The note book and pen barrel are made of 100% recycled paper and the plastic parts of the pen contain corn starch material to reduce the amount of plastic used. The Enviro note book and pen is the ideal product for promoting your company and your commitment to helping the environment. The prices above exclude GST. Printing setup $66.50 per colour and/or position. Includes first half hour of artwork. Subsequent extra artwork $75.60 per hour (both excl GST). Repeat prints in the future with no changes are $47.50 per colour/position. 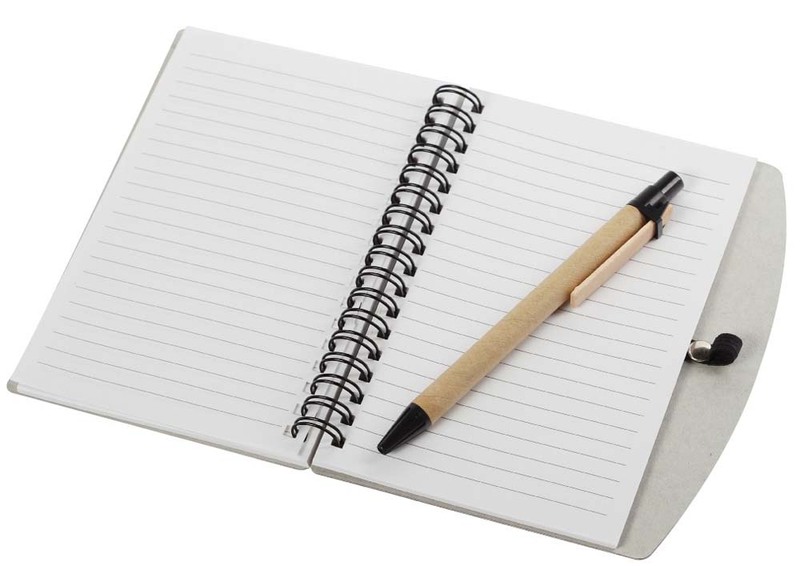 Best selling note book with an 80 page pad in a sturdy plastic cover with matching mini pen. A 60 page note pad with the environment in mind. 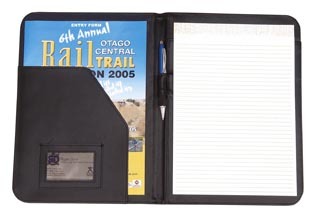 Compact, A7 size, top opening, lined note pad made from 100% recycled paper. Dimensions: 70mm x 70mm x 33mm. Dimensions: 73 mm x 63mm x 35mm. A 15cm ruler with a magnifying bar that magnifies an individual line of text as it is moved down the page. A unique and strong magnetic that can be locked together. Ideal for use on a fridge or filing cabinet and will hold much heavier weights than conventional fridge magnets. 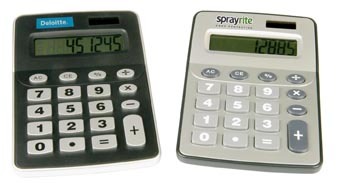 Stylish dual powered calculator with a large print area. 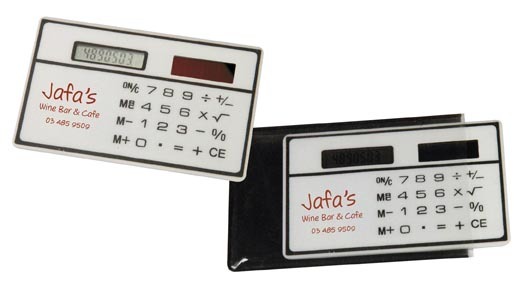 Great printed promotional calculator. Colours available - white, translucent red, trans green, trans blue. Dimensions: 170mm x 32mm x 5mm. Multiple function ruler that can be used as a letter opener and book mark. It has a magnet attached so it can be kept on a fridge or filing cabinet. Dimensions: 118mm x 74mm x 14mm. Front cover: 78mm x 45mm. 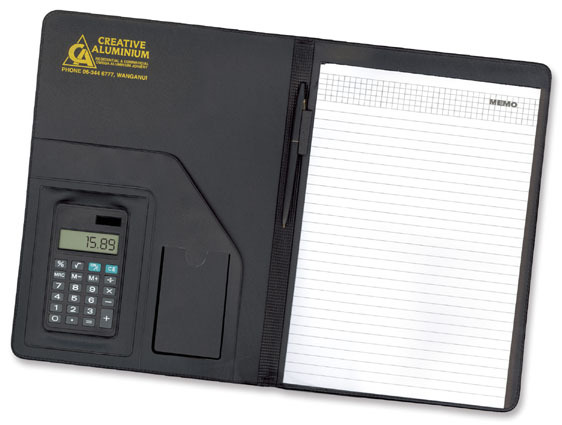 Very popular foldable 8 digit calculator. Colour: White with black sleeve. Dimensions: 86mm x 54mm x 5mm. Packaging: PVC pouch and cardboard sleeve. Credit card sized solar powered calculator. Small enough to be carried in a wallet or business card case. Colour: Clear with Silver trim. Modern designed hand held dual powered 8 digit calculator. 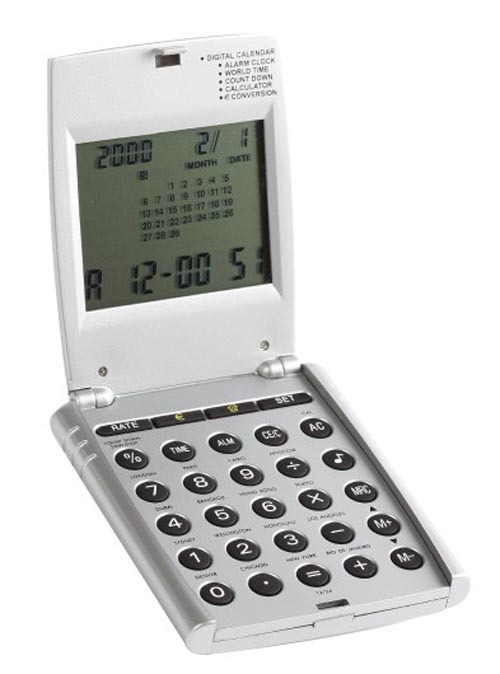 Slim line 8 digit battery powered calculator with a flip top key cover. Dimensions: 170mm x 115mm x 25mm. 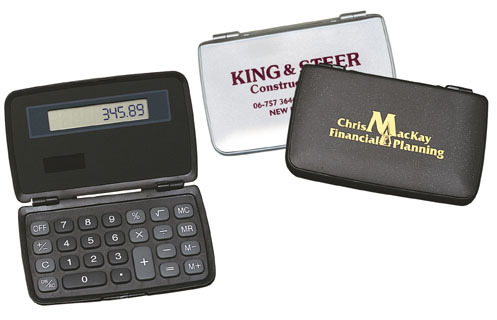 Desk calculator with large keys and display. Print Area: 45mm x 13mm or to fit the shape of the print area. Practical clip board complete with calculator, lined pad and a ruler along one edge. Product Size: 90mm x 76mm. Flip open calcultar with a calendar, clock and more. Product Size: 135mm x 105mm. A conference kit in one handy package. Clear plastic notebook, pen and lanyard. 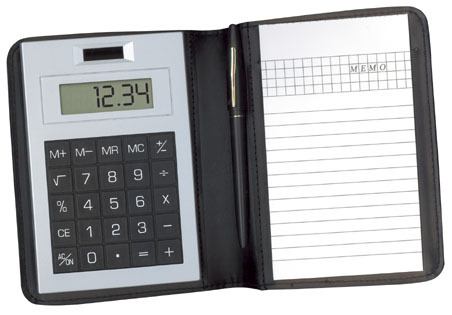 PVC covered, top opening note pad complete with a calculator and pen. Colour: Black with Silver calculator. Dimensions: 160mm x 120mm x 20mm (closed). Print option: 130mm x 90mm on the front print area. P.U. portfolio complete with calculator, pen and A6 size lined pad. Note the prices above exclude GST. Printing setup $63.00 per colour and/or position. Repeat setups in the future are $36.00 per colour and position. Includes first half hour of artwork. Subsequent extra artwork $75.60 per hour (both excl GST). Dimensions: 323mm x 235mm x 20mm (closed) . P.U. portfolio complete with A4 lined pad, pen and calculator. Can be printed one colour or branded with a full colour resin coated finish. Branded with Resin Dome. Depends on size. For Resin Dome Price Click Here. P.U. portfolio complete with calculator, A4 lined pad and closure flap. (pen not included) Can be printed one colour or branded with a full colour resin coated finish. Luxury P.U. portfolio complete with A4 lined pad and a zip around closure. (pen not included) Can be printed one colour or branded with a full colour resin coated finish. Subtantial P.U. 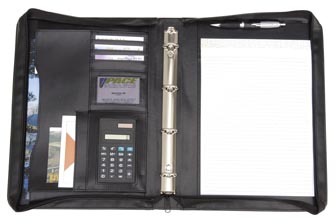 portfolio case with carry handle, A4 lined pad, calculator, ring binder and zip around closure. Colours: Red, Black, Orange, Yellow, Blue, White, Green, Silver. Multi coloured squeezable stress balls with printing available. Colours Available: Black and White (Core above) or single colour: White, Yellow, Red, Green, Blue, Black (TGP). Print Area 40mm x 20mm. Rugby Stress Ball Code Core PSRB (Black and White) or 104934 Single Colours. Stay on your game with this great rugby ball stressball. Colours available - multi coloured panel ball. Download the product spec sheet pdf. Think summer with a stress ball with six coloured panels. Colours: White balls with either black, red or purple hair. Product Size 60mm Round with Hair on top. Download product spec sheet pdf. Foam squeezable stress balls with coloured funky hair. Transfer printed in full colour. Dimensions: 425mm x 380mm (excluding handles). Print Area: 200mm x 130mm. Environmentally friendly bag made from unbleached natural cotton. Transfer Cost for 200mm x 130mm Print Area. There are a heap of uses for this handy clear plastic pencil case with ziplock slider. Print Area 25mm round on the bulb. Need a bright idea - plastic lamp card with LED light. Environmentally friendly torch that does not require pollution producing batteries. Simply pump the handle for instant light. Thirty seconds of gentle squeezing will produce up to 15 minutes of light. Note the prices above exclude GST except for the sale of 1unit which is retail and includes GST. Printing setup $66.50 per colour and/or position. Includes first half hour of artwork. Subsequent extra artwork $75.60 per hour (both excl GST). Repeat prints in the future with no changes are $47.50 per colour/position. 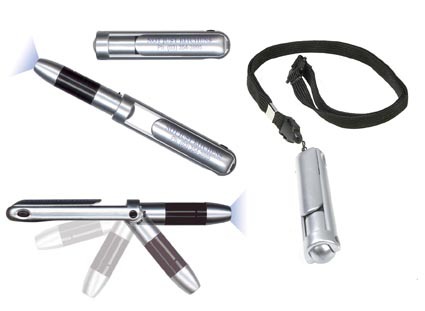 Colour: Aluminium torch with black gift box. Dimensions: Torch - 136mm x 20mm diameter. Print Area: Print - 50mm x 10mm. Laser engrave - 70mm x 9mm. Colour - silver with black trim. Black lanyard available. Dimensions: 100mm x 20mm x 20mm. Self opening spring loaded torch with a pocket clip. It can also be supplied with an optional lanyard. The light comes on as the torch opens and turns off automatically when closed. Dimensions: 86mm x 55mm x 6mm. Useful credit card style torch. Powerful beam and large printing area on both sides.